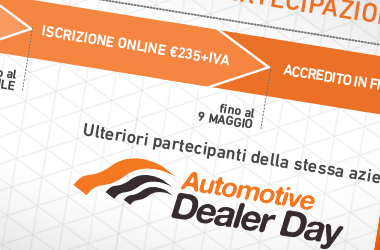 The opportunity to register to the Automotive Dealer Day at a more favourable rate is still available for few days. You can benefit from a reduced charge equal to €195+VAT per participant, instead of €235+VAT. Please note that contextually registering one or more colleagues of the same company you can benefit from a further reduced price equal to €135+VAT per participant. To access the online page of registration click here; if you have already attended Quintegia events please login with your credentials in your possession, otherwise sign up and follow the instructions. Signing up is easy and quick, but should you need any assistance you can call 0422 262997. The list of hotels and agreed upon airlines can be consulted by clicking here. This year you can buy online and at a special rate the ADD13 Service Card, a card including collateral services at a really favourable price. You can buy your Card online, straight while registering, on the website account.quintegia.it, at the price of €59+VAT per participant, or during the event at the Info Point at the Quintegia stand at the price of €69+VAT per participant. Take advantage of this chance, buy your ADD13 Service Card right away; see you in Verona for the new Automotive Dealer Day on 14-15-16 May!